Virginia Commonwealth University Make it real. “What happens culturally when a young nation advances to a position of world leadership? The Frederic and Elisabeth Scott House, one of Virginia’s most important embodiments of the movement called the American Renaissance (1876 – 1917), speaks of some of the possibilities. 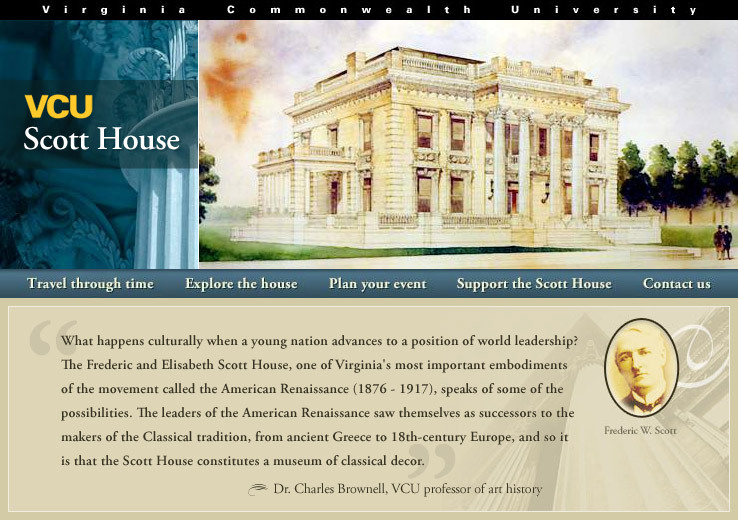 The leaders of the American Renaissance saw themselves as successors to the makers of the Classical tradition, from ancient Greece to 18th-century Europe, and so it is that the Scott House constitutes a museum of classical decor.” – Dr. Charles Brownell, VCU professor of art history.